In the Spring of 2012, while photographing a fundraiser for a local magazine, I had occasion to meet Derek Mitchell. Derek works for a youth center in Lowell, Massachusetts called the United Teen Equality Center. We exchanged a few email messages and at some point I wondered out loud about possibly doing some documentary photography at the center. Derek seemed very enthusiastic about my ideas, especially given that the center was working toward a grand opening of their new wing and the refurbished, historic current home, so he invited me there for a tour. During the course of that summer I had the pleasure of meeting, interviewing and photographing many of the young people and staff at UTEC and seeing, first hand, the great work that they do together. 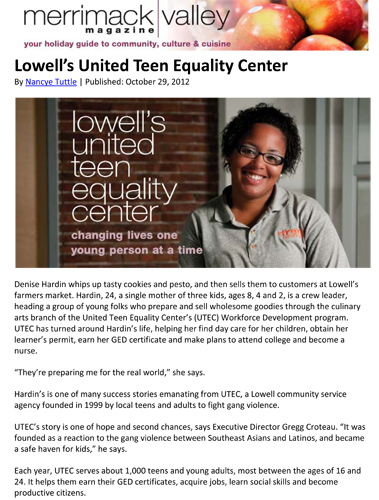 I knew about UTEC before that initial meeting, as do most people in the Lowell community, but I really had no idea of the kind of a positive contribution that these dedicated people make to their city and beyond. I sincerely hope that more people will visit the new center and see the good, positive things that are happening in the gateway cities of Massachusetts and meet the people who make them happen. On November 13th, 2012, UTEC held its Green Building Grand Opening to mark the opening of their newly completed home to the public for the first time. I am pleased to announce that a collection of still images that I created during the summer is featured in the common areas of the new wing. They were on display for the grand opening and will continue to be on display into the future. Merrimack Valley Magazine also sent Nancye Tuttle to UTEC to find out what was going on there. Her article, along with a few of my photos is in the November/December 2012 issue. During that same time I embarked on a wild adventure into the world of short films. The piece that follows is a promotional video that I created for UTEC. This could not have been created without the assistance of UTEC friends, Derek Mitchell and Gregg Croteau, as well as fellow artists and friends, film maker Pete Pedulla and independent film buff and Lowell Film Collaborative co-founder, Suzzanne Cromwell.